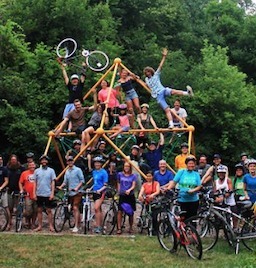 The Ann Arbor Bicycle Touring Society has been active in Ann Arbor and the surrounding communities for over forty years. We organize numerous rides each week for cyclists of many different skill levels and interests. Our signature event is the long running "One Helluva Ride" which takes place each year in July. We also support, and many of our members are active in, numerous cycling advocacy, safety, and charitable groups throughout the greater Ann Arbor area. Look at the rest of our site for rider guidelines and calendars, and bicycle news in general. Hope to see you at one of our rides soon. Order OHR Merchandise now at the link below. Online orders accepted until May 10th. The jersey is sure to become a collector's item. A great value at only $65. You do not have to register for the ride to order merchandise. An OHR embroidered patch will be given to the first 1000 registered participants. A silent ride to commemorate bicyclists killed or injured while riding and part of a world-wide event urging everyone, cyclists and motorists, to “share the road”. For details regarding the purpose see http://rideofsilence.org. Location: Recreation Park - Rutherford Pool parking lot, Congress and Elm Streets. Link to map of ride starting point - https://goo.gl/maps/wD6oy9YKXPL2. The start point is the pool parking lot, just east of past starting points. Ride Length: A little over 9 miles at a relaxed pace taking approximately one hour. Slow bike rides throughout Ann Arbor for everyone. Last Friday of the month. Post-ride fun with friends, neighbors, and visitors around the community. The Spring Classic is always held on the third Saturday of June and is limited to 1,500 riders. It is a road bike event and is a timed challenge ride on the toughest terrain Michigan has to offer and will test you both mentally and physically. It is one of the most grueling and challenging rides you will ever participate in. Four routes to choose from: a 50K teaser, a 100K metric century, a 160K, (100 mile century), and for those who dare… a 200K double metric with almost 10,000 feet of climbing! Event fees are $75 and all riders will receive an awesome goodie bag, which will include a Michigan Mountain Mayhem t-shirt and free swag from their sponsors. Registration opens Jan. 12. Register now, as the event sells out in 2 or 3 days. Do you know about the Lexus Velodrome (601 Mack Ave., Detroit, Mi 48201)? Get the AABTS Mobile apps for iOS (Apple iPhones) and Android devices are ready to install and use on your mobile devices - phones and tablets. The links above will take you to more information about our club. Go to our ride calendars page to view our schedule of rides. We invite every cyclist to become a member; however you are not required to be a member to participate in an AABTS ride. New club memberships purchased after September 1 of any year are good through December 31 of the following year. Come ride with us! Tell your Senator that you support funding for biking and walking!